So Landcorp, the 'governments' farmer, comes out in support of a CGT on farms (among other things). Well they would wouldn't they because it would have zero effect on their operation ... unlike (real) farmers for whom their farms are their livelihood and retirement nest egg. Landcorp ... lackey government mouthpiece. The embattled Immigration Minister has taken another hit per courtesy of his decision to reverse his earlier decision not to deport the serial criminal Karel Sroubek. It now transpires that the 'new' information that caused Lees-Galloway to change his mind was not new information at all. It was in the original file on page five of the twelve page summary sheet .... that Sroubek was an excluded person because of his previous convictions in the Czech Republic. So how we know the Minister in making his decision (as it transpires in a matter of minutes) not only didn't read the feeking file ... he didn't even read the executive summary. His incompetence is breathtaking. And it begs the question ... why the f**k did the PM and the Deputy PM say initially that they too had read the file and they too would have made the same decision as I L-G ... clearly they didn't read the file (or even the executive summary in its entirety). So, while Minister Galloway is revealed as incompetent, Ardern and Peters are revealed as incompetent too (accepting their word that they read the file) or collegial liars at worst (if they didn't read it). Ardern has made it clear she wouldn't sack I L-G no would she accept his resignation. She can't because herself and Peters are equally culpable. And we won't even guess the cost to the taxpayer now that Sroubek has indicated he will be appealing the decision ... another Crimdotcon case in the making with the only difference being that the taxpayer will be picking up the tab. This one would have been right up Legbbut's alley if he hadn't got himself banned for a second time. Twenty years ago Adolf knew a couple, she Australian and he French, who opened a Charcuterie in a wealthy North Shore suburb. Of course he was a charcutier by trade and they prepared and sold wondrous delicacies to the busy local ladies who did not have all day to prepare gourmet meals for their corpulent husbands. A charcutier is a person who, among other things, prepares cuts of meat to the standard expected of a five star restaurant, so that they can be put straight into the oven and cooked. Lot's of herbs, spices and other condiments are used. The practice started some two thousand years ago in northern France and was restricted to preparation of pig meat in such a way that it was preserved without refrigeration. Much was sold to the people of Rome. 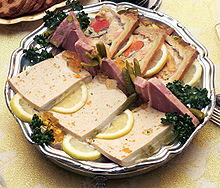 Many of the products were terrines, sausages, pate or jellies. However, these days all sorts of meat are involved. My friends had a very successful business but I doubt if it still operates because the supermarkets and butchers have caught on. Gone are the days when you toddled off to the village butcher and selected from a range of chops, roast, sausage or steak. Last week The Cook brought home from Woolworths a lovely little rolled roast of pork with the skin removed and then rewrapped around the meat. She was able to cook the roast and the 'crackle' separately. Very clever. For some time now we have been buying our meat from a semi commercial butchery with a small retail counter. Wonderful rump steak for $12/kg (Whole rump which I cut to about 30ml.) The other day we picked up their 'Christmas Menu' and, low and behold, it is replete with the art of the Charcutier. Scotch Fillet filled with prawns and garlic butter. Marinated in olive oil, salt, pepper, rosemary, lemon and white wine. Oven-ready $37.50 - 3 kg. It's enough to make Adolf reach for a bottle of Cabernet-Merlot. Across the ditch the Liberal Party has suffered two hammer blows in as many days with a large swing recorded against them in the Victoria State election on Saturday and then yesterday when one of their star recruit newbie MPs quit the Party to sit on the cross-benches saying enough was enough. The Morrison government is now beholden to the cross-benches with its legislative agenda. The Liberals (and the Nationals as their coalition partners to an extent) are now a discredited political force. They will limp through to the election where they will hand Labor the keys to the treasury benches on a plate. John Howard must be shaking his head in disbelief. You dump the leader only to dump the leader and what do you expect. I don't have a great view on Brexit but it's clear that Prime Minister May is in donkey-do-deep attempting to steer a middle course in negotiations with the EU with the agreement alienating both 'Brexitiers' and 'Remainers' in about equal proportions. The reality is that when you attempt the middle road there will always be those on both sides of the fence ready to argue 'too much' or 'not enough'. Parliament is to vote on the deal in fourteen days time. I don't think May has the numbers to win the vote. If Parliament rejects the plan any number of scenarios present ... the most likely one is that the UK will exit the EU in March with nothing in place ... the hard landing option. One thing for sure ... there won't be a second referendum. On checking my bank account a few minutes ago was surprised to see the NZDF had double credited my WDP payment due tomorrow. Have to wonder if this is just me or everybody. Whatever ... brings to mind that old telethon ditty .... thank you very much for your kind donation; thank you very much; thank you very much much. Someone will be getting their hand smacked. The department’s top cops were notified along with Internal Affairs. Each officer involved is now under investigation as the department tried to determine what went wrong. There was great rivalry between Canterbury University and Lincoln College. It was capping week, the time for student pranks. One afternoon a pair of intrepid Lincoln students were returning from a three our session at the pub in town when they spotted a team of Council workmen digging a bloody great hole in the road. One of them had a bright idea. "Have you got sixpence?" he asked. Off to the nearest phone booth he rang the police and told them a gang of Canterbury students, dressed as Council workmen were digging up the road. He ran back and they waited for the coppers to turn up. Before they did, his mate raced off to the phone booth and phone the Council. "Hey, there's a bunch of Canterbury Uni students dressed up as coppers coming to stop your guys working on such and such a street." I'm told it took at least twenty minutes of fairly rough play before both sides woke up. Some other time I'll tell you the story of the Cathedral Square mafia hit. I met the victim some fifteen years after the event, when he was running a news agency in Esperence, W.A. If you are the child or grandchild of a New Zealand Vietnam Veteran then click here to access details of the national essay competition sponsored by the Vietnam Veterans (Neville Wallace Memorial) Children's & Grandchildren's Trust to mark their 25th anniversary of helping the offspring of Vietnam veterans realise their dreams. The competition is being run in two divisions ... one for the children and the other for grandchildren with the winners of each division to receive $1,000 per courtesy of Revera Cloud Services New Zealand. It opens on 4 December 2018 and closes on 28 February 2019. Good luck to all those choosing to participate. A coupla days ago I suggested in a post that HRC might be considering a further tilt at the Presidency. My very good friend Egbut jumped in head first and did a Trump labeling it fake news and opining that it was probably planted by the 'right'. Wrong ... the speculation was ignited after Mark Penn, who worked for the Clinton's for thirteen years, wrote an article in the Wall Street Journal headed 'Hillary will run Again'. He said Clinton would reinvent her public image, this time as life long liberal, claiming she had learned the lessons of her painful 2016 defeat by Trump. "Expect Hillary 4.0 to come our swinging" adding she may leave it late to join the race and later ... "They (Democrats) will see her as strong, partisan, left-leaning, and all Democrat ... the one with the guts, experience and steely eyed determination to defeat Mr Trump". The 'all Democrat' jibe was clearly directed at Bernie Sanders, the Independent Senator from Vermont, who sought the nomination in 2016 but was defeated by Clinton. Penn also pointed out that Clinton at 71 was younger than Trump; was four years younger than former Vice-President Joe Biden and seven years younger than Sanders ... currently Sanders and Biden are the front runners. Clinton would do well to stand on the sidelines and let the other presidential hopefuls ruck and maul each other in the primaries and then make her play over the wreckage as the compromise candidate. If she decides to run that would be her game plan. She would of course enjoy the Republican's whole-hearted support. I do enjoy blood sports. AH IT WAS OUR MISTAKE!! During the last selection campaign some were in error with their interpretation of "NEXT YEAR IS ON ME" as a selection bribe. The silly little girl was only promising to "STABILISE" falling numbers of those eyeing further education opportunities that were a result of "nine years of neglect". Hipkins on Hosking breakfast spinning faster than a virtual "top" attempting to deny the quarter of a billion "bribe" that has failed to get a single additional enrolment. What proportion of thinking citizens were totally at odds with the truth in thinking the shallow slg was trying to bribe students and their domestic funders. I was one who thought it a blatant bare faced bribe using our money. 1520 this afternoon and the sky turned black and this came down ... bloody climate change!!!!!! So Winston First is confident that after his little chat with Vice-President Pence that NZL will soon get an exemption from the tariffs imposed by the US on our steel and aluminum exports. Of course we heard this all before, five months ago, after he talked with Secretary of State Pompeo. And then just last week at the United Nations Peters instructed our diplomats to vote in support of a series of resolutions attacking Israel. In contrast Australia and Canada either voted No or abstained. The US voted No on all the resolutions. Peters clearly doesn't understand the political dynamic involved. Our anti-Israeli stance in the UN will have endeared us to the White House not. Happy to be proven wrong on this but actions speak louder and words and, to date, our pleas for exemption to the tariffs have been met with a deafening silence. Wouldn't hold my breath too long on this one Mr Peters. At the very best it is a f**k-up by an incompetent and arrogant Minister. At worst ... I'll leave that to your imagination remembering that St Jacinda advised 'us' to read between the lines before making judgement ... dumb comment. Let's delve into the incompetent and arrogant bit and in doing so we'll put to one side the revelation that I L-G now admits that it took him less than an hour to make the 'most difficult decision of his ministerial career' and noting that he didn't even read the complete file ... now I would have thought a smart and savvy minister, making a legitimate decision, might have recognised the decision was going to attract huge public scrutiny and offered to brief the Opposition in advance of going public. If he had done that any controversy would have been headed off at the pass. But no, he chose not to and he is now reaping the consequences of that. I note that Red Radio is playing its part in running defense for I L-G by broadcasting an interview with his mother in the Czech Republic which she argued in essence that her son was a good boy and loved small animals and things ... what c r a p.
Some have opined Lees-Galloway's decision was predicated on the fact that Sroubek might have negotiated a sweetheart deal with the Police to become a 'supergrass' informant in return for his staying here (does happen). Well, if that were he case then the ensuing brouhaha has rendered him useless in that regard and all because the Minister was so incompetent and arrogant to understand the dynamics in play. But of course there might be other matters contained in the file that I L-G, the Prime Minister and the Deputy Prime Minister didn't want the Opposition to see. By any measure this is a clusterf**k for the government and it's not going away anytime soon. Watch this space. Today's Australian details an interesting case of corporate bastardry. In this case the bastardry involves nothing of any serious use, such as a coal mine or a pine plantation or a few thousand acres of prime farmland. No. 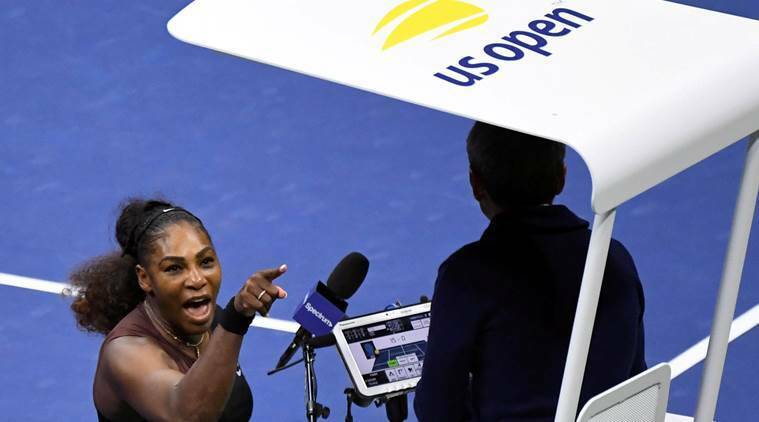 It all revolves around the granting by Tennis Australia of the contract to televise the Australian Open - a week of prima donnas hitting a ball at each other and swearing at the umpire. What caught Adolf's eye in the long list of accusations, brought against one Harold Mitchell by the Australian Securities and Investment Commission, was the apparent calculated dishonesty of a director who sought to deceive his board and financially damage his employer. The matter centres around Tennis Australia in 2013 awarding the contract to televise the Australian Open to Channel 7 for a period of five years, without engaging in a competitive tender process. Withheld material information from the board. Failed to inform the board about the value of the broadcast rights and the best way to market them. Failed to inform the board that a better price could be obtained by going to tender. Passed to the successful bidder information about it's competitors' bids. God knows where the other board members left their brains during their discussion of such a significant matter. It seems to me this fellow's parents slipped up when they failed to name their child Judas. Thus might innocent board of directors have been forewarned. I imagine the above list is just a small sample of his alleged transgressions. Someone could have some sport here with the Companies Act. Mr Mitchell appears to have recently retired from the board. Did a lot of air miles last week and got back to Paihia late on Friday night ... stuffed. Was down to play in the RSA golf tournament on Saturday and tee'd off with no great expectations. As it was I shot my best round of the year with 41 stablefords and a net 67 to come in third. Picked up some 'goodies' too. Back in the good books. $84 UNDERPANTS SEEM CHEAP IN 2018, SOMEHOW? SO REALLY SAFE THIS TIME EH ANDY? MORE ON LAWS AND RUGBY. ANOTHER VICTIM OF #ME TOO? COULD HAVE DODGED A BULLET. SICK OF BEING A MUSHROOM? TWO PIES MIGHT NOT DO IT, SBG. BREAKING NEWS, NAH, MORE LIKE BREAKING WIND. IS THE US BODY POLITIK BROKEN? WOOD NEXT MOVE BE CHANGES?